WASHINGTON, D.C. — Due to a significant increase in adverse incidents, the U.S. Environmental Protection Agency is taking a series of actions to increase the safety of spot-on pesticide products for flea and tick control for cats and dogs. Immediately, EPA will begin reviewing labels to determine which ones need stronger and clearer labeling statements. Next, EPA will develop more stringent testing and evaluation requirements for both existing and new products. EPA expects these steps will help prevent adverse reactions. In dogs and cats that can include skin effects, such as irritation, redness, or gastrointestinal problems that include vomiting or diarrhea, or effects to the nervous system, such as trembling, appearing depressed or seizures—from pet spot-on products. Requiring manufacturers of spot-on pesticide products to improve labeling, making instructions clearer to prevent product misuse. In addition, to improve the regulatory oversight of pet products, EPA will require more standardized post-market surveillance reporting on adverse effects, require submission of more sales information so the agency can better evaluate incident rates, and bring up-to-date the scientific data requirements on pre- and post-market testing so they are more in line with the Food and Drug Administration’s requirements. Flea and tick products can be appropriate treatments for protecting pets and public health because fleas and ticks can transmit disease to animals and humans. While most people use the products with no harm to their pets, the agency’s analysis determined that smaller dogs tend to be disproportionately affected by some products and that the exposure of cats to some dog products is a concern. People should carefully follow label directions and monitor their pets for any signs of an adverse reaction after application, particularly when using these products for the first time. EPA recommends that owners consult a veterinarian about the best way to protect their pets from fleas and ticks or whether pesticides are needed, especially before using any product on weak, aged, medicated, sick, pregnant or nursing pets, or on pets that have previously shown signs of sensitivity to pesticide products. EPA is coordinating these actions with Health Canada as Canada also identified similar concerns about the use of spot-on flea and tick products last year, and with the Food and Drug Administration’s Center for Veterinary Medicine. 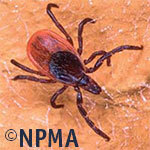 Visit the EPA website for more information:Controlling Fleas and Ticks on Your Pet.